Trivia has a shiny new home on the RTE Drama Department’s website. It looks great, I think, and has a handy little review of Series One for anyone who missed it (shame on you, by the way). You can take a peek here. 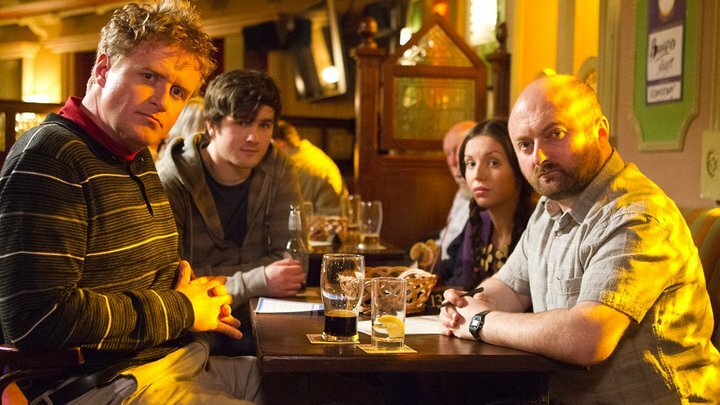 George (Damian Kearney), Brian (Fionn Walton), Tina (Liz Gitzgibbon) and Lawrence (David Pearse). you don’t mind. I wwas interested to find out how you center yourself and clear your head prior too writing. I’ve had trouble clearing mmy thoughts in getting my thoughts out. Hi there. Some days it is hard to get going, no matter how long you’ve been writing. If it’s not happening for you, I’d say you shouldn’t force it. There have been times when I’ve sweated something out just for the sake of doing it. It might make you feel better in the short term – ‘Made my target word count today!’ – but in the cold light of day you invariably find that anything written against its will is of poor quality and winds up getting cut anyway. My only other piece of advice (it’s not ‘mine’, mind you; it’s ancient) is that you should stop every day at a point where you know what you’re doing next – that is, don’t write until you hit a brick wall. That way, you start the next day under less pressure. You may still have a bad day but at least you know what you’re doing first. Hope this helps a little.